Anyone whose meditative gaze has fallen even briefly on this magazine's Contents page over the past 15 years is aware of the myriad ways in which images of the semi-legendary Zen patriarch Bodhi Dharma (aka Daruma) find their way into Japanese arts and crafts. The sixth century saint credited with transplanting Zen Buddhism from India to China — and, among other miracles, creating the green tea plant — shows up on everything from revered scroll paintings to roly-poly papier-mache dolls. The former were traditionally brushed by zen masters to inspire zazen practice and the quest for enlightenment, while the latter are today played with by politicians in the hope of stealing an election, which at least gives an idea of the malleability of this cultural icon. In ukiyo art of the Edo Period, one occasionally sees Daruma depicted as a female. In some cases this was merely an attempt at farce, a joke at the time because of the (hopelessly mistaken) belief that no woman could possibly face a cave wall in silence for nine years, as the patriarch was said to have done. On the other hand, the image of a lady Daruma in red could also signify to the viewer a scarlet woman, a prostitute. This meaning evolved from the fact that Daruma dolls have no legs — the saint's fell off in the course of his nine-year sit — and always quickly bounce back upright from the horizontal position. Presumably, neither of these popular imagination references was what the Osaka artist Yanagawa Yukinobu (act. 1819-32?) had in mind when he designed fig 1, a female Daruma in a (now faded) bright red robe. The face is that of renowned Kabuki actor Arashi Tomisaburô (act. 1790-1830), but this ôban sheet is not your typical actor print, either. Though dramas were devised highlighting a few historical Buddhist figures like Priest Nichiren (1222-1282), no character modeled after Daruma ever made it to the stage. Instead, the Yukinobu work seems to belong to a special class of non-commercial ukiyo-e called surimono — prints produced in small numbers for limited distribution. Hallmarks of a theatrical surimono are the presence of praiseful poems, and the lack of descriptive text detailing actor name, role, or publisher. Specifically, surimono like Fig. 1, sponsored perhaps by a fan club or wealthy individual, served to announce the imminent return to the Osaka stage of a beloved actor. 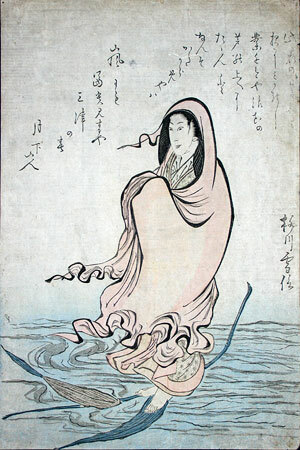 While the most common "welcome back from Edo" approach entailed recycling an image of the star in a stock role and adding a poem by way of explanation, Yukinobu went to the unprecedented length of baldly equating Tomisaburô's homecoming trip down the Tôkaidô (in 4/1822) to Daruma's miraculous crossing of the Yangtze River on a reed 1,300 years before. The earlier event (historians assume Daruma used a reed boat) signified the arrival in China (and eventually Japan) of epochal, culture-changing Buddhist teachings. In comparison, even a tongue-in-cheek one, what might Tomisaburô possibly be carrying with him? Spiritual gems? Secret stagecraft? The latest Edo gossip? What was Yukinobu (an artist, by the way, with extremely few prints to his credit) thinking of? Easier to answer is why the actor appears in feminine guise. Well, Tomisaburô's fame rested on his abilities as an onnagata — the term for male actors who specialize in female roles — and, history and logic be damned, fans of the star would have been shocked to see him depicted on a print as anything other than a woman. The convention was thus duly maintained, albeit in this instance probably at the cost of a snicker or two among the public. Tellingly, well over a decade passed before another Osaka print played so loosely with Buddhist imagery, but that instance actually surpassed Yukinaga's Daruma for outrageous ukiyo irreverence. A kabuki superstar died and one of the memorial prints showed the actor lying outdoors on a platform, surrounded by a grieving throng of humans and animals. Sound familiar? That is the way the Buddha himself is depicted on his deathbed. Footnote: In 1823, Yukinobu changed his name to Nobusada, after studying under Yanagawa Shigenobu, the famed surimono artist who had moved from Edo. Shigenobu started the (small) tradition in Osaka of ôban beauty prints, but, like his pupil, can boast of only a small number of prints produced there.